Jeff from the Snowy Tundra had the brilliant idea of having a virtual race today, Cornfest...both 5k and 10k distances. I celebrated the event by signing up for the Green YMCA Caribbean 10k. This was my first 10k and I am glad to say that I did a bit better than I expected. The course was mostly flat. It was a 2.5k out and back track. The 5k racers ran it once, and the 10k racers did it twice. My only complaint about the whole thing is that they didn't do a good job of yelling times through the course. The only time I heard was at mile 1 -- 8:32. I did a great job pacing myself from the start. 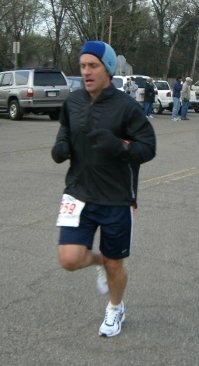 I ran past the 5k finish line at about 26:30. After that, I thought I felt myself slowing down. At approx mile 4 and mile 5 I slowed to a walk for about 30 seconds as I grabbed water, but that was the only slow down I had. Final time: 53:37 -- a pace of 8:38 per mile. I was hoping for under an hour, and expected my final time to be closer to 56 minutes based on my time for the first half and that I thought my pace was slowing. I feel great knowing that I was able to maintain a very steady pace through the whole race. Weather was great. It was in the upper 60s at race time with partly cloudy skies. The course was almost completely flat. I heard someone say that they didn't like the course because you went through the same scenery four times. I think it helped for pacing. Mile 1 was marked, and then on the second time through the course, mile 5 had been marked. In the few races I have been in, it has been rare to see mile markers. So knowing where that single marker was on the first lap and then being familiar with the course really helped you to know approximately how far you were at any point in time. I have been having leg issues the last couple weeks. I am mostly better, but still have some pain in my hip. I was dying to play ultimate frisbee last night since I didn't play last week and won't be able to next week. But I erred on the side of caution and only played three games...we normally play 8-10. My hip was hurting when I finished playing, so I was worried about today, but it felt great through the whole race. Also, with my run today, we are past 500 miles on the year, into South Carolina, and only a couple miles away from the half-way point to WDW! Congratulations to everyone who has finished Cornfest, and good luck to those of you still waiting for your time to start. Awesome time Craig!! Very cool that you were able to incorporate a real race into our virtual one. Great report and congratulations on your Dual Meets. I agree with Basil. It is cool that you found a local to enter today. Did Kristin run either event? I know she wasn't sure about her work schedule. Good job. I guess we take for granted here in our races that someone will be calling out the mile splits. Great work, Craig! Very speedy! Realized how much I missed the competition, crowd, etc. to help motivate me. Why haven't I been visiting your blog? I totally missed it! I'm sorry for that.